Mum left over a week ago now and is settling back into winter while summer in Toulouse has finally arrived and it is suddenly very hot. It is like someone has flicked a switch and we have been having temperatures in the 30's for several days now. It is lovely and hot although it doesn't seem to heat up properly until about 2pm and is still very hot late at night. 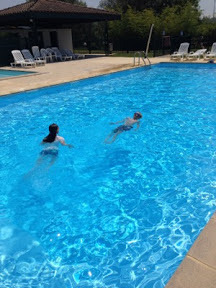 The kids are enjoying the pool and even though it is shared by all the houses in the street yesterday it was empty most of the day and only got busy at bout 7pm. I think a lot of people are still working and even though school is out a lot of kids are at holiday programmes. When it is now so hot it is hard to believe that just over a week ago I was in my boots and jacket going to Paris! Mum and I got up early and decided to drive to the airport (actually that was Jasper's idea) as last time I got a taxi it cost me €45 for a ten minute ride. 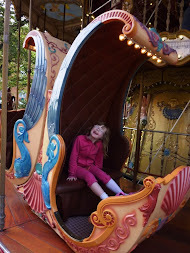 Finding a park was a bit stressful but we made it in plenty of time. The idea was for me to text James where the car was so he could collect it later. Instead of texting him I texted all the details to a friend who wondered why she was getting all this info about carparks from me and of course I didn't realise my mistake until the plane touched down in Paris. Luckily James doesn't get phased easily so just rearranged his plans to fit around my mistakes - oops. We had organised for a taxi to pick us up from the airport but the message must not have got through as there was no taxi for us. Instead we joined the quite short que at the tax stand and were very quickly heading into Paris. Our check in was at 1.30pm but even though it was only 9.45am decided to drop our bags at the hotel. The maitre'd was not that thrilled to see us so early even though we tried to reassure her we didnt want to check in just put our bags somewhere secure. With a bit of an eye roll she put our bags in the office and we were out into Paris. 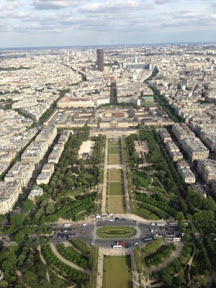 It was hard to believe that we had left our house at 6.30am and were walking the streets of Paris by 10.15am. First stop was to find a cafe and have a coffee. I used my very basic French to order our beverages and food and the waiter thanked me for using French - so that was nice. While at the cafe James rang to say the meeting at the new school for Hannah had gone well and that she would be starting sometime in the new school year once a new teacher aide had been found. Such a relief after a very stressful time with IST. 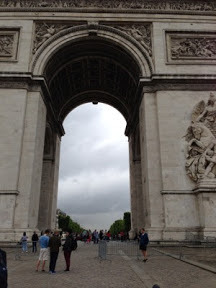 Next on the agenda was the Arc de triumph which was very impressive. 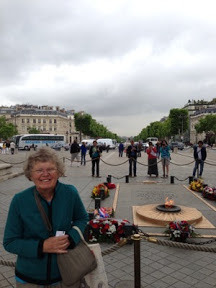 We then wandered down the champs de élysées stopping in at a few shops on the at. 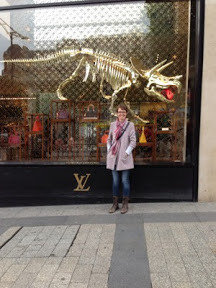 The Louis Voution shop caught our eye and we went in but at €300 for a wallet we weren't tempted - although it amazed me how many people were actually buying stuff. 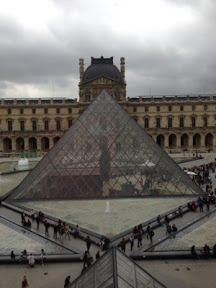 We found a nice cafe for lunch then wandered down to the louvre. Although there was a bit of a que it only took 20 minutes to get in and then once we were in the building as it is so emourous the masses of people just got swallowed up. Because it is so big there are cafes in each building but for the privilege of doing so it will cost you! A coffee cost €5 and even though Mum felt like a cup of tea she could not bear the thought of paying €9 for a pot of earl grey. The view out the window was pretty impressive though. We continued to look around and made our way to the Mona Lisa which had a big crowd around it but we still managed to get a good look. We then went and found some Monet's - which seemed to be at the top of an endless staircase (thankfully we found the lift for the journey down). After four hours in the Lourve we decided we had had enough so wandered back to our lovely hotel (recommendation here for the Best Western Trocadero - great location, great, sized room and great price). 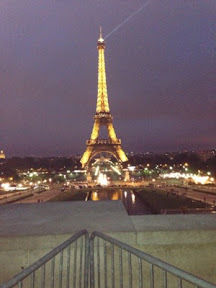 We then wandered across the road and went and had dinner and decided to go take a look at the Eiffel Tower by night - magic! 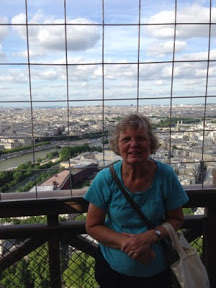 The next day we decided to do the Hop on hop off bus, Notre Dame and the Eiffel Tower. 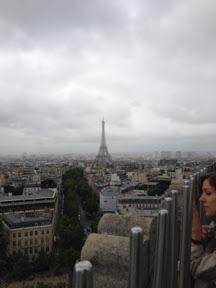 It is was a bit cold and drizzly on the bus but we didn't stay on long choosing to get off at Notre Dame. There was a stage set up outside and singing going on and we discovered the church was actually closed. Mum worked out that as it was the 6th of July that it was St Paul's day and it was closed for a service. We went back later in the day but it was still closed and wasn't opening until 4.30pm. 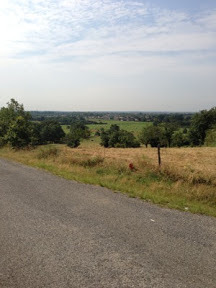 As it was at the opposite end of Paris to where we were staying we decided we would just have to leave it - a good excuse for Mum to come back to France. 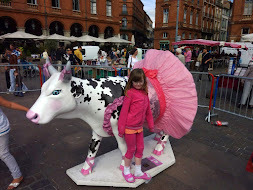 We decided to head to the St Germain area and found lots of lovely little Parisan alleyways and cafes. 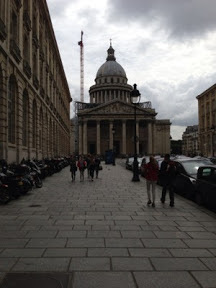 We headed to the Pantheon and Mum shouted me the entry fee. 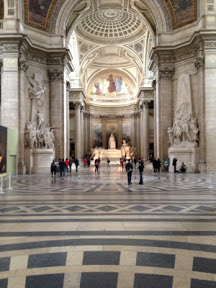 I loved the Pantheon as after seeing so many churches it was really nice to see a beautiful historical building that was not a church. It had the most amazing crypt that just seemed to go forever and was filled with memorials to interesting political figures. It made me think how many of these people had been revolutionaries for a good cause and perhaps despised at the time by those in power. We decided to get Macdonalds for lunch and sat in the beautiful Jardin du Luxembourg surrounded by tourists and Parisians. 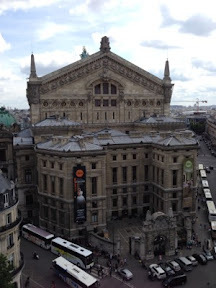 We then jumped back on the bus and carried on around to the Opera. 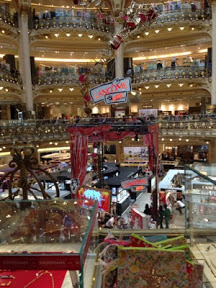 We decided to get off and go to Galleria Lafeyette the big department store. They had just started there big sale and there were hundreds of people crammed in. 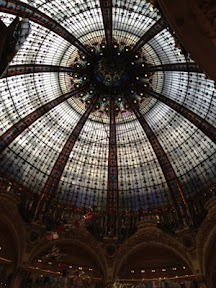 It is a beautiful building with a gorgeous domed ceiling and balconies. We headed to the roof and admired the view. We got back on the bus and headed for the Eiffel Tower. The que was as long as predicted and as I had not been able to book tickets online (there were no more allocated tickets left for Friday or Saturday) we got in line. All in all it didn't take too long to get up and from the time we started queuing until we came down was two hours - so a pretty good way to spend the afternoon in Paris. The next morning we were up early to catch a taxi to the airport. Charles de Gaulle isn't the easiest airport to find your way around but we managed to get Mum checked in and went and had some breakfast. We then said our goodbyes and I caught the train to terminal 1 to catch my plane which was a couple of hours later. Unfortunately I had a bad headache coming on and ended up being quite sick so was very thankful to finally get on my plane so I could sleep. After having Mum here for 5 weeks the house felt very empty without her. Life though as continued to be busy as both Jasper and Hannah came down with the chicken pox the day after mum left. So unfortunately they both missed their last week of school - extra sad for Hannah as she is not going back to IST. This week though everyone is healthy and the kids are at a holiday programme run by our church every morning. The kids are loving it and it has been such a blessing for me to have a break after a busy few weeks. I even managed to go for a walk this morning before it got too hot.